Bodyweight Burn Review - Which Home Workout? Bodyweight Burn is an independent home workout program that offers fun and unique workouts, each of which conveniently last around 21 minutes. Most importantly, Bodyweight Burn actually delivers great results and, for the current offer price of $19, it offers unrivalled value for money. If you're looking to shed body fat through the use of a convenient home workout program and don't want to pay the higher prices associated with other vendors, then Bodyweight Burn is for you! Don’t Have Time To Read The Full Review? This review is over 2,000 words long. If you’re pressed for time, read this FAQ to learn about Bodyweight Burn’s key points. Bodyweight Burn is a home workout program designed by Adam Steer and Ryan Murdock. It targets fat-loss through time-efficient workouts which are scientifically proven to be the optimum length of time to exercise. How Long Are These ‘Scientifically-Proven’ Workouts? Adam and Ryan claim the scientifically-proven optimum length of time to work out is 21 minutes. The workouts in Bodyweight Burn last for 21 minutes, give or take a few minutes for warm-ups/cool-downs. Who Are Adam Steer And Ryan Murdock? They are the founders of Bodyweight Burn. Between them, they hold numerous qualifications and certifications, including: NCSA-CPT; NCCP 3; CSIA Lvl 4 Course Conductor; CSCF 3; Biosignature Certified; MAT Lower Body Specialist; CST Certified; AKC Certified Coach. That’s a lot of acronyms and I didn’t have space here to write their true meaning. Just Google them, if you’re interested. 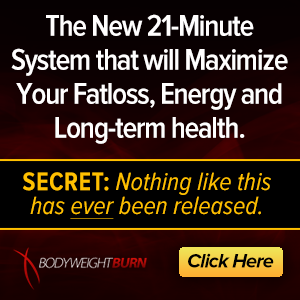 How Long Is The Bodyweight Burn Program? The only piece of equipment I recommend you purchase is a set of resistance bands. Read more in the Recommended Equipment section. Do I Need A Lot Of Room? No. Pretty much all exercises are done ‘on-the-spot’, so even the smallest lounge will suffice. How Much Does Bodyweight Burn Cost? It’s currently on offer for only $19! Where Can I Buy Bodyweight Burn? Directly from the vendor here: Click Here! What Results Can I Achieve? You should be able to burn off 21lbs+ of fat. Does The Program Come On Discs Or Online Only? The $19 offer is for the online-only version. 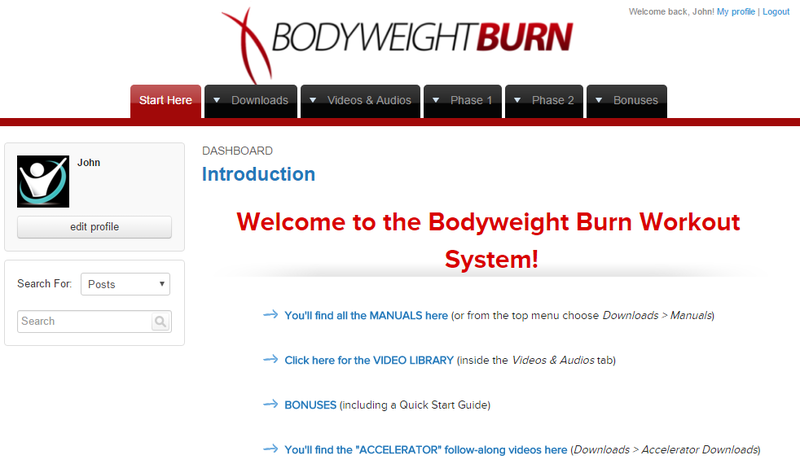 All videos and manuals are downloadable and can be accessed via the Bodyweight Burn portal. There is an option to get the program on discs for $147. What exactly is the Bodyweight Burn home workout program? Is it as effective as the more popular BodyBody programs? Given its comparatively low price, can it still deliver great results? How qualified, knowledgeable and motivating is the trainer? 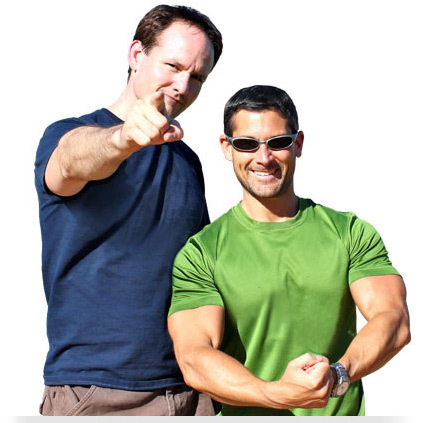 Adam Steer and Ryan Murdock, the creators of the Bodyweight Burn home workout program, promote short, intense and time-efficient workouts. They believe that exercising for longer than 30 minutes is a waste of time and energy and can be counter-productive. Bodyweight Burn was designed around Adam and Ryan’s claim that 21 minutes has been scientifically proven to be the optimum length of time for a workout. As such, each workouts lasts for…you guessed it, 21 minutes (excluding any of the additional optional exercises). Do I believe this claim to be true? Actually, yes. In the same way that there is an optimum speed to drive a car for maximum fuel efficiency, I believe there is an optimum amount of time to exercise for maximum benefits. Is 21 minutes accurate? Perhaps. Using the previous example relating to fuel efficient driving, every car’s optimum speed will differ, perhaps only slightly, in the same way that some people who are less fit than others may not be able to exercise for a full 21 minutes. Whilst I’m not going to begin a debate on whether shorter, high-intensity workouts are better than longer, low-intensity workouts (there are plenty out there already), I will say that I’m a big fan of the former, which is why Bodyweight Burn suited me. Another principle Adam and Ryan employed in Bodyweight Burn is one which I strongly believe in and one that many others will come to realize: You can shed fat and build a lean, muscular body without expensive gym equipment, using only your bodyweight. This, of course, requires a continuous change in your workout, incorporating a variety of exercises, to avoid hitting a plateau. Bodyweight Burn contains over 45 unique exercises, all of which are demonstrated in the Exercise Instructional Videos and in the Exercise Manual booklet. 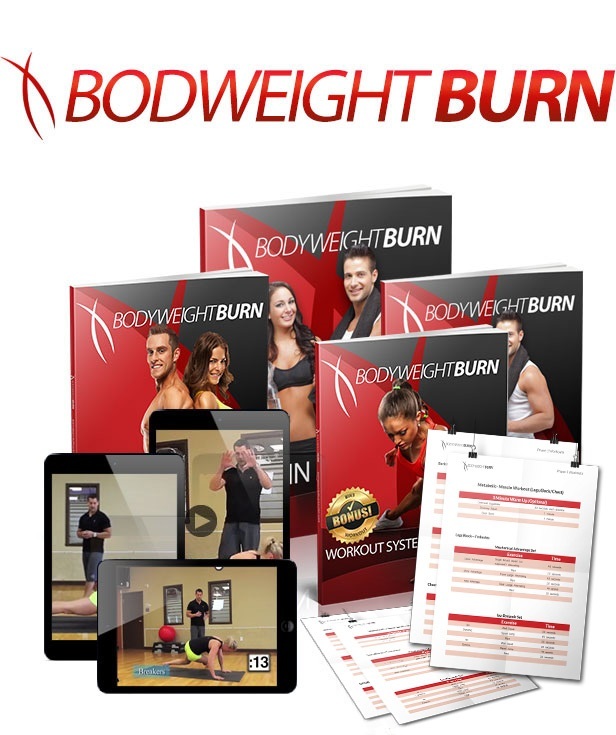 Technically, Bodyweight Burn doesn’t have a box: it’s a digital product which you access via a web portal. The video items are in MP3 format and the booklets and guides are in PDF format. All of the videos are downloadable, so if you need to watch them on your TV it’s easy enough to download and transfer them onto a portable hard drive or USB memory stick, or if you have a Smart TV or Google ChromeCast (or similar) you can just cast the videos directly from your computer to your TV. And the PDF booklets are printable, obviously. By ensuring the product is all-digital, the creators are able to save a lot of time and money in printing and shipping costs hence the low, low price of only $19. So, what is in the box on the web portal? The usual short guide that explains what you should do prior to starting the program: take your measurements and before photos etc. A detailed booklet with descriptions and images demonstrating how to perform the 45+ individual exercises contained in the program. Printable charts detailing every workout in the program and the exercises, their difficulty level and target rest time for each workout. A short but useful guide on how to use Bodyweight Burn along-side other programs, if desired. For example, if you’re a bodybuilder who wants to use Bodyweight Burn to shed fat whilst still lifting weights. This library contains 12 downloadable workout videos, each of which contain a single, entire workout which you can exercise along to, plus an additional 3 warm-up videos and 3 cool-down videos. As you can probably guess, this is an audio-only version of the Follow-Along Video Library. These audio files can be stored on your phone or MP3 player and are handy if you’re working out somewhere where there’s no TV or computer. A relatively extreme 12-day diet plan designed to shed a lot of weight fast. This guide briefly discusses the benefits of important supplements, such as multivitamins and fish oil, before then proceeding to detail an effective low-carb diet plan. This guide expands on the brief supplement discussion in the 10-in-12 Diet System guide, detailing specifically which supplements are essential, which are optional and how and when to take them. Similar to this article I wrote on supplements. PS. You should note that all of this is accessible on mobile devices, too! The Bodyweight Burn portal home screen. Click to learn more. Unless you exercise on thick carpet, a yoga mat is essential to protect your back and knees during your workouts. An exercise stepper is used in the Shoulders Block but is primarily used for raising the feet during push-up exercises to further target the shoulder muscles. Any raised object that you can place your feet on, such as a sofa or chair, will have the same benefit, which makes this piece of equipment optional. The Swiss ball is only used for a handful of exercises, most noticeably during the Shoulder Block for a small number of stretching exercises. As a Swiss ball can be very versatile I’d highly recommend you invest in one. In this instance its function is to utilize the core muscles during exercise, however, it’s not a problem if you don’t have one as this function is secondary to the exercise itself. Resistance bands are featured heavily in Bodyweight Burn and are the one item on this list I would consider to be essential. They are required for several exercises in the Lactic Circuit and Arms Block and are required for 99% of the exercises in the Back Block. Bodyweight Burn is a 12-week program broken down into two 6-week phases. Each phase has a 7-day routine which is repeated each week for the duration of that 6-week phase (see detailed phase description below). As stated in the program overview, each workout lasts approximately 21 minutes, this being the scientifically proven optimum length of time to exercise. Some workouts consists of 1 or more ‘blocks’. For example, the Metabolic-Muscle Workout consists of the Legs Block, the Back Block and the Chest Block. Each of these blocks are like ‘mini-workouts’, and are used and re-used throughout some of the wider workouts. 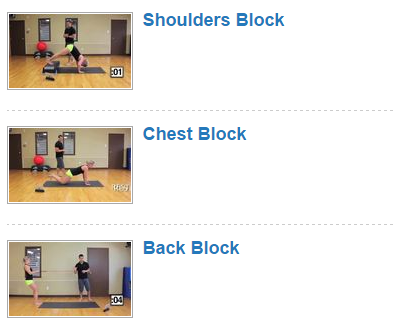 Screenshot of the mini-workout blocks. Click to learn more. The goal of the Metabolic Base phase is to shock and confuse your muscles and shift your body into fat-burning mode through mixing up intense cardio and resistance workouts. The Metabolic Explosion phase ramps up the intensity of the workouts to prevent your body from becoming accustomed to the phase 1 workouts. In addition, this phase looks to take advantage of afterburn, or Excess Post-exercise Oxygen Consumption (EPOC) as it is formally known, the benefits of which are discussed throughout the program. Read more about each of the individual workouts in the next section. This section of the Bodyweight Burn review details the types of exercises you will find within each of the workouts. The legs block contains front lunges and a variety of squats, such as wall squats, single-bound squats and jump squats. The back block makes good use of the resistance bands so ensure you have a pair, although dumbbells will work equally well. Exercises include rows at different widths using a variety of grips and a range of flys. The chest block consists of a very wide range of push-up exercises, utilizing various hand placements and holding positions. This block contains shoulder stretches and more variances of the push-up, such as downward-facing dog push-ups, designed to target the shoulders. The arms block also utilizes resistance bands. In the video, they are wrapped around a door frame for stability. For the bicep muscles, the exercises are a variety of “scoop” curls. For the tricep muscles, a variety of bent-over tricep kick-backs. The core block contains a range of lying leg raises and plank exercises. As you can guess from the name, this workout really burns! Afterburner A is a form of interval training, the format of which consists of one exercise only. You can select the exercise from Floor Climbers, Jump Squats, Jump Lunges or Breakers. It is performed for 8 seconds of maximum effort followed by 12 seconds rest. This workout lasts for 21 minutes. Afterburner B is an interval workout, as above, but with slightly different parameters: exercise for 60 seconds at 90% intensity followed by 75 seconds rest. The exercise for this workout is Sprinter Burpees. No choices this time, sorry! Afterburner C is slightly different from the first two. it is a circuit-style workout in the form of interval training: 3 exercises performed for a total of 90 seconds, followed by 60 seconds rest. Another circuit-style, interval training workout where 3 exercises are performed for a total of 90 seconds, followed by 60 seconds rest. Cardioflow is, as it sounds, a non-stop cardio workout. It contains an array of bodyweight exercises targeting every muscle such as T push-ups, bicycle crunches, squats and deadlifts. Metabolic Muscle is a circuit-style workout with an exercise in place for every muscle in the body, with only 10 seconds rest in between. What Results Can You Expect From Bodyweight Burn? Adam and Ryan claim you should be able to burn 21 pounds of fat by the end of the 12 weeks. It sounds like a bit of a marketing ploy with this whole 21 pounds in 21 minutes deal but, as it’s well known that anyone will burn 1-2lbs of fat on average per week whilst on a decent diet and training program, to burn 21 pounds in 12 weeks is a very realistic goal and an achievement that a lot of people would be more than happy with. It’s good to see Adam and Ryan have not gone overboard with their expectations, unlike the creators of some home workout programs who make ludicrous claims that you can burn 100lbs+ of fat or look shredded with no hard work. In fact, Adam and Ryan specifically state on their website that Bodyweight Burn is not for you if you don’t like hard work! Screenshot of the Afterburner A workout. Click to learn more. Bodyweight Burn: Who Is It For? Anyone whose fitness levels are relatively low and/or cannot exercise for long periods of time. Whilst the Bodyweight Burn workouts are challenging, they’re not crazy-intense, so it’s a perfect program for beginners or the experienced who aren’t quite ready for the tougher programs yet. If you’re looking for a program that offers the same level of convenience through short workouts but are ready for the next level of intensity, Insanity MAX:30 could be for you. Read the review here. Is Bodyweight Burn Good Value For Money? There should be no question that, at $19, Bodyweight Burn is fantastic value for money. In fact, in my opinion, it’s an absolute steal. There certainly aren’t many, if any, other $19 home workout programs that have had as much time or money invested into them as Bodyweight Burn. As you may or may not know, BeachBody products are typically recorded in a large gymnasium, sports hall or a similar facility often with many participants, all of which have the bodies that we consumers desire. Whilst this can, and does, provide motivation, these participants are sure to be compensated for their role in the production of the program, thus creating a cost that BeachBody need to recoup. Whilst the exact figure is kept a secret, Carl Daikeler, the chairman and CEO of BeachBody, said the company spends “over $100million each year on product advertising” and a Bloomberg article from 2012 stated that BeachBody would spend $120million in advertising that year. This kind of overhead alone should demonstrate why BeachBody must charge relatively high prices for their products. In my opinion, it’s not that Bodyweight Burn is unusually cheap, it’s that BeachBody products are expensive, and we’ve become accustomed to their high prices. Bodyweight Burn is only available directly from the vendor and is not available on Amazon or other third party websites.